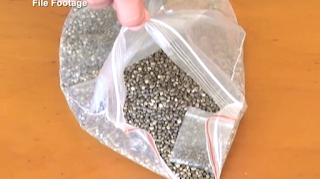 16,000 marijuana seeds have been found in ‘Eua close to the residence of a suspect who is in police custody in Nuku’alofa. The bag of seeds was found on a road on the eastern side of ‘Eua at Lokupo last week by an elderly man who owns a tax allotment close by. Police Superintendent in ‘Eua -Inspector Loluhama Fine says they arrested a man from the allotment two weeks ago for cultivation and possession of drugs. They collected from that warrant more than 200 marijuana plants with more than a thousand seeds. Radio Tonga reports the man has been previously convicted of charges related to illegal drugs. No one has been charged for the latest seeds collected. Fine says the seeds are fresh. Eua Police officers are continuing investigation and have reported to the Tongatapu headquarter the latest development. During Radio Tonga’s Talkback Show last week a caller recommended that Defense Officers should be sent to ‘Eua to hunt for marijuana. Another caller proposed to remove any tax allotment from owners whose land are known to cultivate marijuana plantations.